David Anderson has been a popular columnist in his parish for many years. Writing about everyday experiences-like cleaning up the yard after a rainstorm, waiting in the doctor’s office, even helping his teenage daughters pick out fall dresses-he explores how the divine can surprise us in ordinary events. 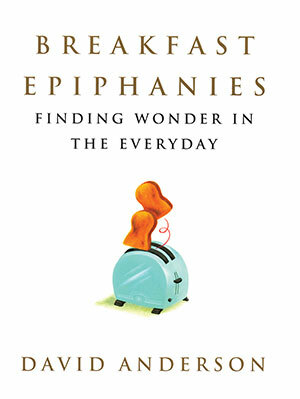 Breakfast Epiphanies is a collection of his wonderfully written, true-life tales. In these inspiring stories, Anderson writes with disarming honesty and a great deal of humor about relationships-both within his family and within the community he serves. He writes about a family argument that turns ugly, an awkward but triumphant date to his first father-daughter dance, and the night his church burned down. He also writes about personal spirituality, but always from the ground up. A story begins in some ordinary event-listening to a baby cry in a crowded airplane-and opens out to a new, sometimes offbeat awareness of the divine. Whether Baptist or Buddhist, Catholic or Congregationalist, we all yearn to find splendor in the ordinary. Breakfast Epiphanies speaks to the hearts and minds in all of us, no matter what faith we practice.